Vasari refers to Bulgarini in his Lives, calling him Bologhini and attributing to him an altarpiece in the church of Santa Croce in Florence and stating that he was a pupil of Pietro Lorenzetti. The artistic personality and oeuvre of Bulgarini has proved difficult to reconstruct due to a lack of surviving information. The artist was identified by Millard Meiss, who also identified some of his works, which had previously been associated with two other painters, Ugolino Lorenzetti and the Master of the San Pedro de Ovile Madonna. The discovery of a 16th-century inventory that included the name of Bulgarini in Siena cathedral meant that it was possible to identify a painting of The Annunciation to the Shepherds in theFogg Art Museum, Cambridge (Mass. ), as one of the images from the Saint Victor Altarpiececommissioned from the artist. The Virgin and Child enthroned belonged to a reverend Hawkins in the UK, and was auctioned at Christie’s in London in 1977. It was catalogued in that sale as by Ugolino Lorenzetti but was tentatively associated with Bartolommeo Bulgarini. It was attributed to the latter in the 1986 catalogue of the Thyssen-Bornemisza collection in which the artist’s problematic identity was discussed. Texts by Ghelazzi Dini of 1982, Pope-Hennessy of 1983 and Boskovits of 1990 all supported the attribution to Bulgarini. The small size of the panel has led to the suggestion that it was a work intended for private devotion. The output of such compositions notably increased in Sienese workshops just prior to the mid-century. In this panel Bulgarini locates the Virgin in a frontal position symmetrically flanked by four angels who hold up a rich brocade cloth, and by two saints. On the right Saint John the Baptist is recognisable by his hair shirt and long hair, but the female saint bearing the martyr’s palm on the left is more difficult to identity as she lacks specific attributes. 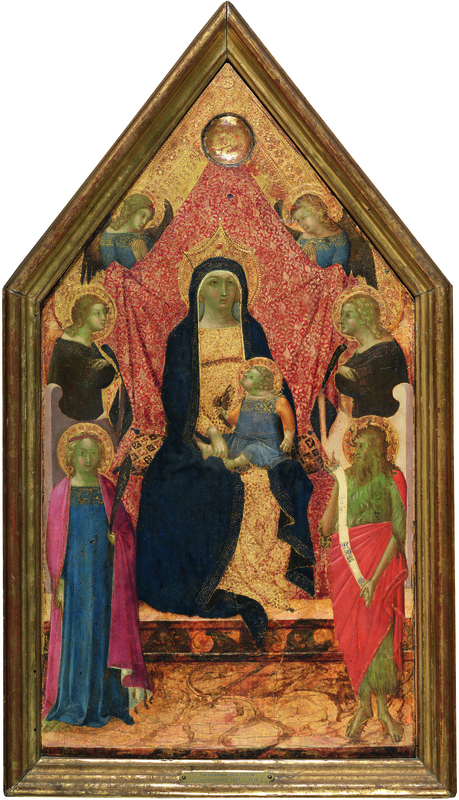 Bulgarini’s panel is richly executed due to the treatment of the gold, which is particularly emphasised in this work and whose surface is extremely finely worked. Also notable in this small panel, which was possibly the centre of a triptych, is the tender atmosphere that envelops the figures such as the Christ Child and the angels. This detail, along with the type of faces, brings the artist’s style close to that of Pietro Lorenzetti. The circular cavity in the upper centre may have housed a relic or may have been used to contain a jewel. Boskovits dated the panel to around 1340–45 during the artist’s mature phase.